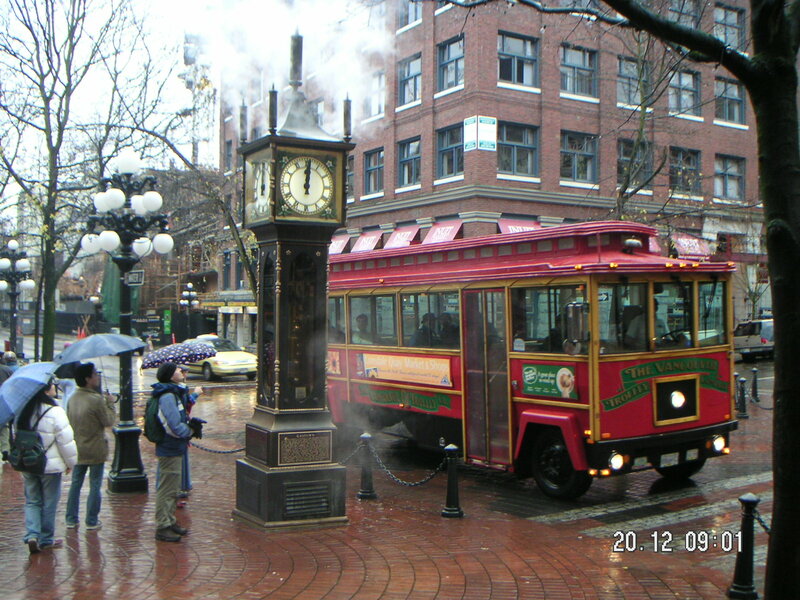 Dating back to 1867, Gastown is Vancouver’s oldest neighborhood, established even before the city itself. Consider that in this same year, New York City saw the creation of the world’s first elevated railway. This speaks to how young Vancouver truly is. In the mid-nineteenth century, “Gassy Jack” Deighton arrived with a barrel of whiskey on the south shore of Burrard Inlet. There he discovered a vast wilderness populated only by First Nations people and workers from a local lumber mill. When Gassy Jack established a saloon to satisfy the local thirst for whiskey, Gastown was born. The neighborhood’s rough-and-tumble history saw its return during the Great Depression years. By the 1960s, Gastown was facing demolition. Luckily, a group of Vancouverites worked together to save this historic area, and now it is one of the most vibrant neighbourhoods in the city. Gastown has seen many changes, but through it all, the cobblestone streets, distinctive architecture and character have remained. Bound by Water, Homer, Columbia, and Hastings Streets, the heart of Gastown boasts gorgeous views of snow-capped mountains and the Burrard Inlet. A variety of restaurants, shops, and boutiques can be found in the area. 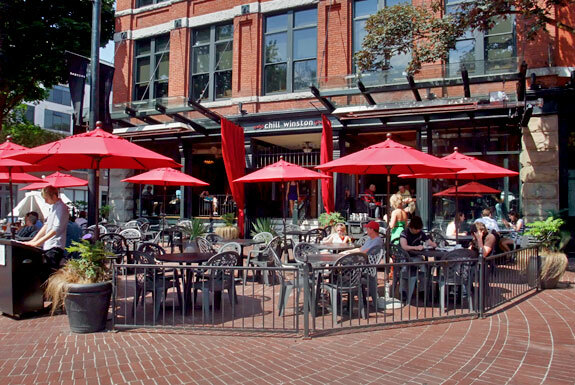 Located near the ferry terminals, Gastown is easily accessible by foot. Kitschy souvenir stores are popular in the area, but for more adventurous shoppers there are numerous retail options. For the evening hour, try Chill Winston, a restaurant and lounge with an expansive bar area and exposed brick walls, open kitchen, large patio, and extensive wine list. 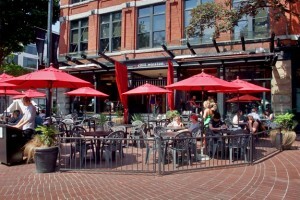 Trendy Flux Bistro features west-coast tapas style cuisine, offering large and small portion options for both appetizers and entrées (162 Water Street, 604-678-8800). For a blend of Latino and West Coast styles, check out Cobre (52 Powell Street, 604-669-2396). Steamworks Brewing Company provides a wide range of beer options (the Gastown Brewing Company brews on site) in addition to a variety of classic grill options, including an array of wild BC salmon dishes. With its Parisian inspired Art Deco ambiance, Social At Le Magasin offers contemporary Canadian cuisine, seasonal menus, and organic ingredients, as well as a separate seafood and oyster bar in the downstairs space (332 Water Street, 604-669-4488). 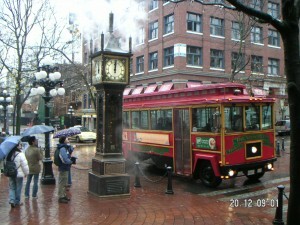 Shopping for fashion and accessories is a blast in Gastown. 212 Boutique features the line’s NYC inspired fashion for men and women, as well as fashion by independent designers (454 West Cordova Street, 604-685-2426). Urbanity offers beautiful and unique knits (sweaters, blankets, coats, etc) from Oleana of Norway, handmade shoes, and accessories by local textile designers. (207 Abbott Street, Vancouver, 604-801-6262). Featured in the New York Times Style section, Button Button sells buttons from all over the world, with choices from the extravagant to the practical. Check out Woo Vintage for hand selected vintage items (321 Cambie Street, Vancouver, 604-687.8200). Obakki is an international design house emphasizing a sense of rustic luxury with its elegant but relaxed men’s and women’s collections (44 Water Street, 604-669-9727). 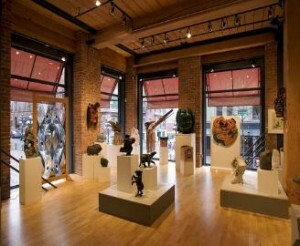 There are several unique galleries located in Gastown. The Jeffery Boone Gallery showcases the work of new and emerging artists with a focus on painting and photography (1 East Cordova Street, Vancouver, 604-838-6816). Since 1979, the Inuit Gallery of Vancouver Ltd has offered a museum-quality collection of masterwork Inuit and Northwest Coast art in the heart of Gastown. For truly unique home ware retail, try Industrial Artifacts Inc., which specializes in custom work, as well as the preservation, restoration, and transformation of industrial designs for the artistically inclined and environmentally conscious (49 Powell Street, 604-874-7797). Koolhaus Designs offers a wide range of home ware items, including furniture and home accessories (One Water Street, 604-875-9004).